If you encounter the CLOCK WATCHDOG TIMEOUT Blue Screen of Death error while using your Windows 10 computer then it is most likely caused by a specified processor which is not processing interrupts. This occurs when the processor is deadlocked or nonresponsive. Specifically, this kind of Stop error occurs when the processor is having a hard time with the cooperation of its threads and cores. The threads are the tasks performed by cores and some cores can have many threads at the same time. And this is where the problem begins – one thread is waiting for an adequate response from another thread or one kernel is waiting for a response from another kernel and those responses are not coming. In other words, when the processor is unable to continue the processing of tasks since its resources are occupied and are interdependent to get free, such state is called Deadlock. The CLOCK WATCHDOG TIMEOUT bug check has a value of 0x00000101 which means that an expected clock interrupt on a secondary processor, in a multiprocessor system, was not received within the allocated interval. 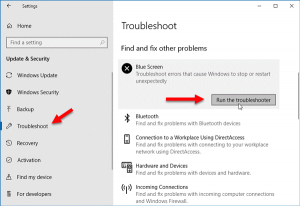 To troubleshoot the problem, you can check out the possible fixes provided below but before you proceed, make sure that you boot your computer into Safe Mode with Networking only. Start your computer normally and check if the CLOCK_WATCHDOG_TIMEOUT 0x00000101 error is now fixed. Tap the Win + R keys to open Run and type mdsched.exe and hit Enter to open the Windows Memory Diagnostic Tool. Once your computer has restarted, perform a basic scan or you could also go for the “Advanced” options such as “Test mix” or “Pass count”. Simply tap the F10 key to start the test. The next thing you can do to fix the CLOCK_WATCHDOG_TIMEOUT 0x00000101 Stop error is to rollback, or update, or disable device drivers. It is most likely that after you updated your Windows computer that your driver also needs a refresh. On the other hand, if you have just updated your device drivers then you need to rollback the drivers to their previous versions. Whichever applies to you, refer to the steps below. In this option, you will have to disable or remove hardware you’ve just installed recently since external devices could be the one that’s causing the Blue Screen of Death error to appear. To do that, just disconnect any external device that’s connected to your computer physically and then check if it fixes the CLOCK_WATCHDOG_TIMEOUT Blue Screen error. You can also troubleshoot the Blue Screen error in a Clean Boot state. There are times when third party applications cause BSOD errors. Putting your computer in this state can help you identify which program is the culprit and thus isolates the problem. In a Clean Boot state, your computer will start using only the pre-selected minimal set of drivers and startup programs. Note that you have to disable and enable one process at a time. Log onto your PC as administrator. Type in msconfig in the Start Search to open the System Configuration utility. From there, go to the General tab and click “Selective startup”. Clear the “Load Startup items” check box and make sure that the “Load System Services” and “Use Original boot configuration” options are checked. Next, click the Services tab and select “Hide All Microsoft Services” check box. From there, start to isolate the problem by checking which one of the programs you installed recently is the root cause of the problem. 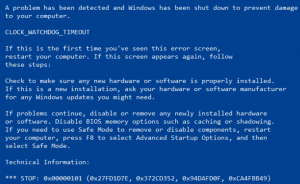 Updating the BIOS can help you fix the CLOCK_WATCHDOG_TIMEOUT BSOD error but as you know, BIOS is a sensitive part of a computer. Even though it is a software component, the functioning of the hardware depends on it largely. Thus, you must be careful when modifying something in the BIOS. So if you don’t know much about it, it’s best if you skip on this option and try the other ones instead. However, if you are well-versed in navigating the BIOS, then follow the steps below. Next, type “msinfo32” in the field and press Enter to open System Information. From there, you should find a search field on the bottom where you have to search for the BIOS version and then press Enter. After that, you should see the developer and version of the BIOS installed in your PC. Go to your manufacturer’s website and then download the latest version of BIOS in your computer. If you are using a laptop, make sure that you keep it plugged in until you have updated the BIOS. Now double click on the downloaded file and install the new BIOS version in your computer. Now restart your computer to apply the changes made. If the fixes given above didn’t help you in fixing the PNP_DETECTED_FATAL_ERROR Blue Screen error, worry not, as there is still another option that could help you. This option is Advanced System Repair, also known as a “one-click” solution. What makes ASR better than other system utility tools or antivirus programs is that aside from helping you free up disk usage and memory in your computer, it helps you in fixing whatever issue your system is facing including BSOD errors. Aside from that, it also cleans out your computer for any junk or corrupted files that help you eliminate any unwanted files from your system. This is basically a solution that’s within your grasp with just a click. It’s easy to use as it is user-friendly. For complete set of instructions in downloading and using it, click on this URL address.